Stata's power command performs power and sample-size analysis (PSS). 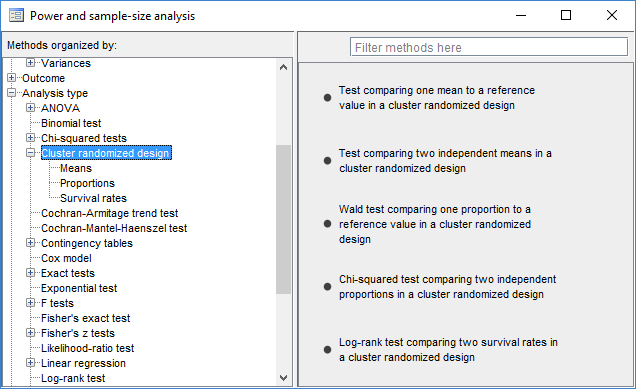 Its features now include PSS for cluster randomized designs (CRDs). As with all other power methods, the new methods allow you to specify multiple values of parameters and to automatically produce tabular and graphical results. In the presence of clustering, observations within the same cluster are correlated. In a CRD, groups of subjects (clusters) are randomized instead of individual subjects, which leads to clustering of subjects. With clustered data, the sample size is determined by the number of clusters and the cluster size. 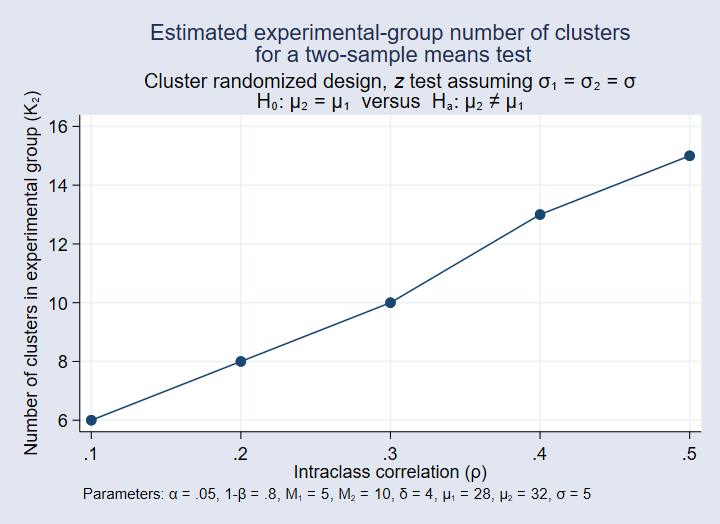 The sample-size determination involves either the determination of the number of clusters given cluster size or the determination of cluster size given the number of clusters. 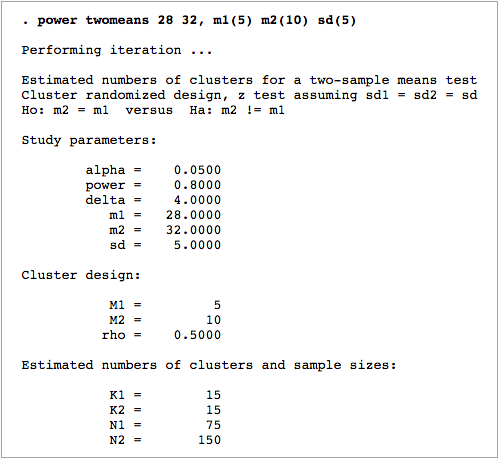 The commands compute one of the number of clusters, cluster size, power, or minimum detectable effect size given the other parameters, and they provide options to adjust for unequal cluster sizes. For two-sample methods, you can also adjust for unequal numbers of clusters in the two groups. Suppose that we want to compare the means of body mass index (BMI) in two groups of patients with type-2 diabetes randomized to receive standard care (the control group) or patient-centered care (the treatment group). The randomization is applied to general practices that patients visit instead of to patients themselves. We want to compute the required number of clusters for the study. We want to detect the mean BMI of 32 in the treatment group if the mean BMI of the control group is 28, if the standard deviation is 5 in the two groups, and if the intraclass correlation is 0.5 (the default) in the two groups. We anticipate at least 5 patients per practice in the control group and 10 in the treatment group. By default power twomeans assumes a two-sided test with a 5% significance level and a power of 80%. We need to recruit 15 practices with a total of 75 patients in the control group and a total of 150 patients in the treatment group. The default intraclass correlation of 0.5 may be too high for this type of study, and so we want to explore the required cluster size for a range of smaller intraclass correlations. By default power plots the required number of clusters in the treatment group on the y axis. As the intraclass correlation increases from 0.1 to 0.5, the required number of practices in the treatment group increases from 6 to 15.